Well, three months ago I didn't even dream of owning a motorbike. Two months ago I considered the idea crazy. A month ago I thought the idea quite likely, but one thing I definitely would not do for a while is the crazy trip nick-named the 'death ride' or something like that by one of my co-workers, Bien Hoa to Saigon. Well, now I did it. 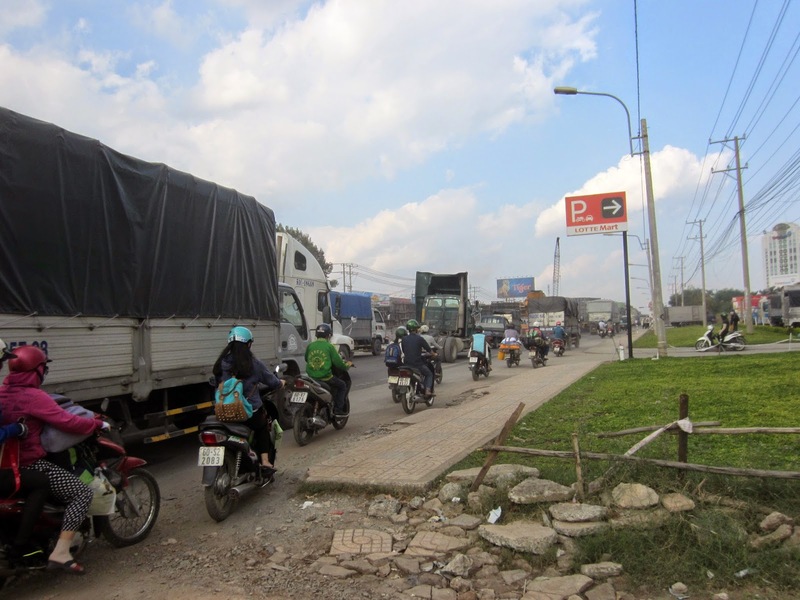 Bien Hoa – Saigon in a nutshell: at non-rush hour expect it to take about an hour. It's about 30km, same distance that I did in 20 minutes when I worked 30km away over the summer. But, well, that's going at 120km/h in a car on a Finnish motorway for most of the time, whilst here it's 40km/h on a Vietnamese motorbike. 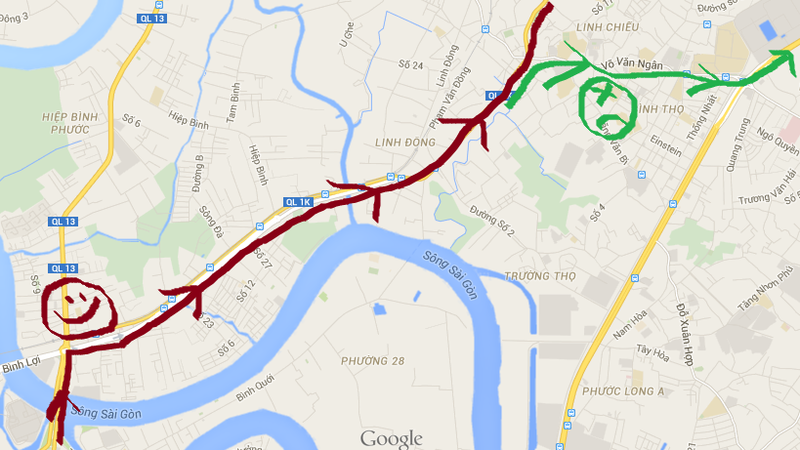 The route was meant to be simple: Go straight, just remember to turn left just before entering central Saigon. Okiedokes. I carefully looked up the route on my maps (well, lacking a bit on that since I have no map of the area between Saigon and Bien Hoa...) and google maps, and I drew a great piece of art which is a map on my arm. Bought a new, 'good' helmet ('good' = looked decent and cost enough money to be hopefully qualified as decent). Face-mask on, check. Helmet on, check. Valuables in the seat locker, check. Back-bag on back, check. A suitable amount of money in pocket to bribe any potential policeman, check. It started off well. 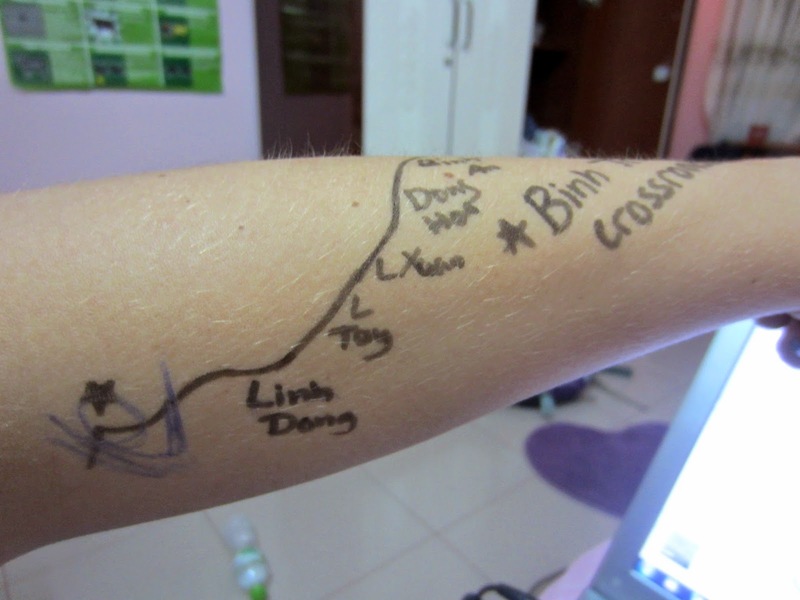 I crossed the bridge and made my way through Binh An, Dong Hoa, Linh Xuan and Linh Tay, all names written on my arm. Awesome. About 45 minutes in, the clear main road suddenly divided into two. I wasn't worried, since even though it was divided, both roads were equally big and just running parallel to each other. I happened to choose the right-hand one. It started gradually going further away from the left-hand one. Oh well, it still seemed like a main road. Till it stopped being a main road. Quite suddenly that big main road swerved to the right and became quite a small, markety street, reminiscent of a centre of a town. Ok, dilemma. Turn back (=attempt to turn back, not quite sure how it would work here) and hope that the left-hand road looks better, or continue and trust you'll end up somewhere? Obviously option two. Especially since I felt I wasn't the only confused one – there were two women on a bike in front of me who looked confused when the road decided to minimize itself, and they even talked to one of the shop keepers who seemed to wave them on, indicating they should go forward and then turn left. Or something. Well, obviously they were asking for directions to Ho Chi Minh City, and he gave them. I'll just follow them. At some point they gave up and turned back. Luckily I am a strong, confident and independent driver who is not easily rattled by things like roads potentially going in the wrong direction. Sigh. 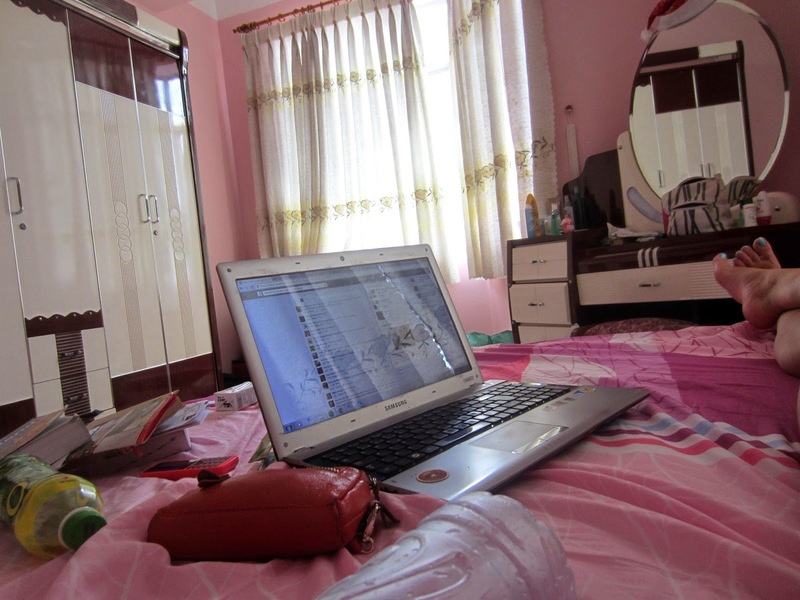 Next I was definitely in the centre of Thu Duc, a suburb/far away district of Ho Chi Minh City. 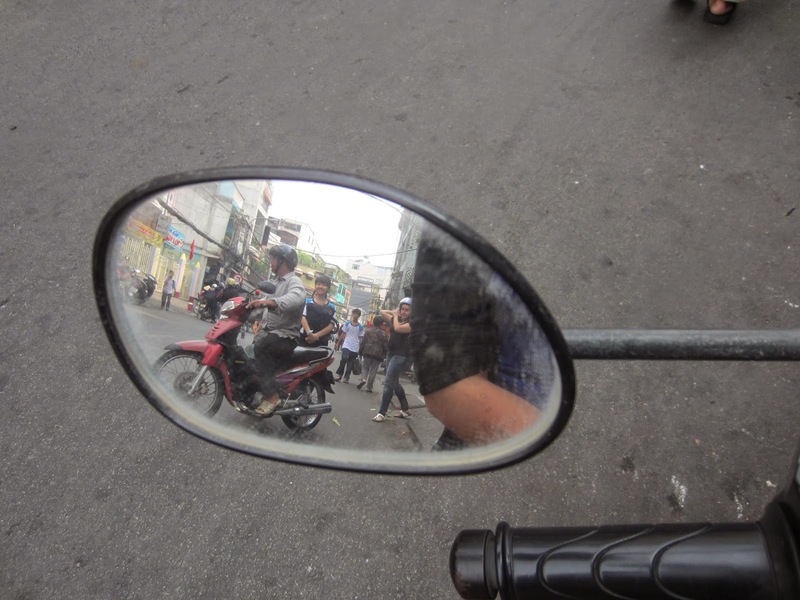 I had no knowledge and definitely no map of Thu Duc, so after a while I pulled up on a pavement to stare stupidly at my map, and then ask a nearby old man which way Saigon was. He helpfully told me (turn right here, so apparently I hadn't been going too much in the wrong direction...). Ok, cam on! A bit more driving. (So much happened I actually can't remember the order of stuff now lol.) At some point I was crossing a big bridge, one that was familiar from my bus trips, and I saw the Bitex Financial Building (the highest building of Saigon), looking so promising and inviting and definitely telling me I was on the right track. Ah, finally. I had no idea where I was on the map, though, after my detour of Thu Duc, so when I saw bus number 150 I was very excited. I had taken bus number 150 once before, and I know it goes from Bien Hoa to Saigon. If I just follow it... managed to keep up quite well – it was generally faster than me, but it frequently stopped so I managed to keep up. Then I lost Bus Number 5. 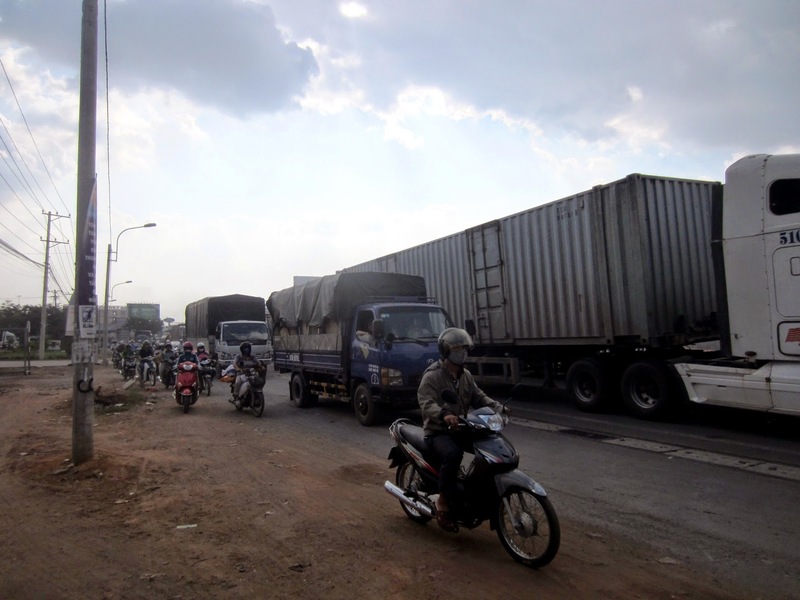 About two minutes later I approached a sign saying something on the lines of “Welcome to Binh Duong Province”. Ah, thank you, wonderful. Except that Binh Duong Province was a province which was most definitely not towards Saigon, but closer to Bien Hoa. Crossed another stupidly crazy roundabout, and pulled over in front of some random café stall to stare once again stupidly at my pointless map which obviously did not even show where I was. Luckily, as always, there were friendly Vietnamese people around. These two men at the café came to ask me if I needed help, and I managed to tell them I wanted to get to Saigon (though made the whole thing a lot more complicated by talking about Binh Duong and Thu Duc, wanting to 'prove' to them I wasn't a complete imbecile, that I did know I was not in Saigon, but obviously name-dropping other places just confused them more.) In the end one of the dudes, a star, jumped on his bike and told me to follow him. He was on the phone most of the time and sometimes turned round to talk/gesture to me (what about, I have no idea), but I followed him for a good ten minutes until he stopped underneath some bridge at yet another roundabout, pointed to a main-looking road and said “Saigon, nine kilometre”. He refused my 50,000 I offered him, and I got going down the road. 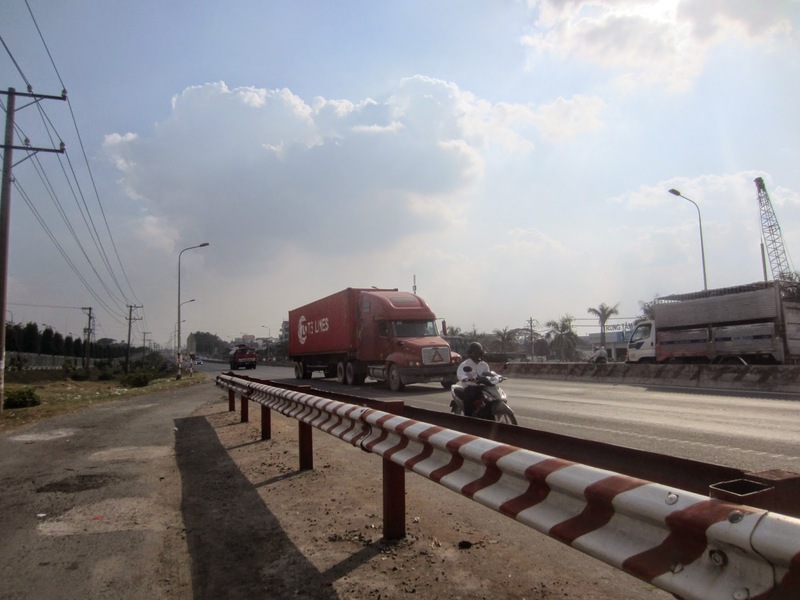 It was a big, 'official' looking road, pretty modern for a Vietnamese road. And I was clearly driving into the city. And, crossed yet another bridge. Saw the same Bitex Financial Tower, a bit further away and in a completely different direction to when I saw it previously half an hour ago. But still, right direction. Again. Hurrah. Wait, wait, not so fast. Because the next... CHALLENGE was on its way. As if Saigon was not complicated enough to navigate, the Saigonese are lucky to have the adventure of One Way Street Navigation. My final forty-five minutes of the trip was hopelessly circling the area where the post office was, always just out of reach behind some one-way street. It was a vicious cycle of checking the map, memorising the route ('right, left, right'), stashing the map away, driving off, going right, going left, realising you can't go right at the next one, deciding you'll just go right at the one after, realising you can't go right there either, nor at the next, giving up, finding another pavement to park on, staring at the map, memorising the route, AND SO ON. Well, a three-hour adventure, which left me absolutely shattered for the whole day. I love Tài and I love motorbiking, but it did get quite frustrating. And also, drinking water was not on my agenda whilst navigating them Vietnamese streets so was quite badly dehydrated as well. 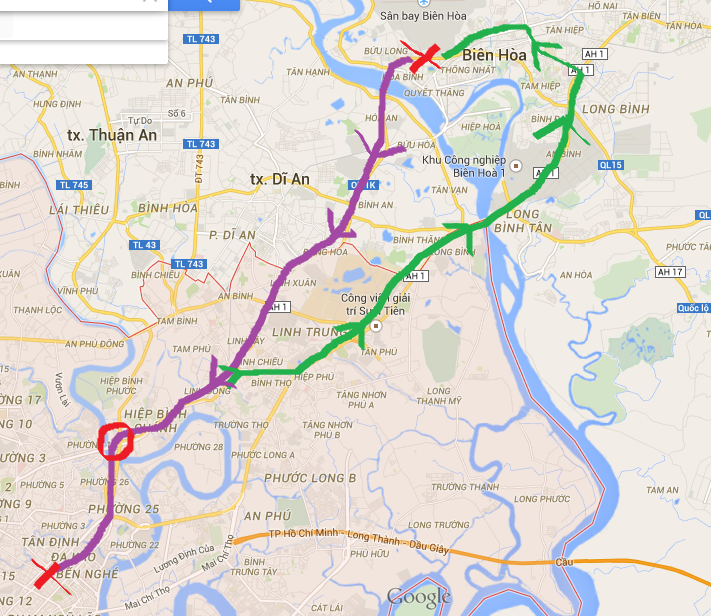 The way back to Bien Hoa was slightly though not much easier. I was pressed for time since I had a lesson to teach. Once again, I made extra sure I had a very clear map on my arm. Go straight, and remember to turn right onto Pham Van Dong street, and from then on it's just following the main road till Bien Hoa. Easy peasy. Happily made it onto Pham Van Dong street and complimented myself on my newly acquired skill of Sense of Direction. As always, there were roadworks ahead making life a bit more confusing. We got to this dusty roadworky roundabout, and it looked as if the only way was right. There was a roadsign with an arrow and some Vietnamese text, and it seemed all the other vehicles were going there, so I followed. Just a detour I guess. After a while got to one of them roundabouts and I saw the street name. 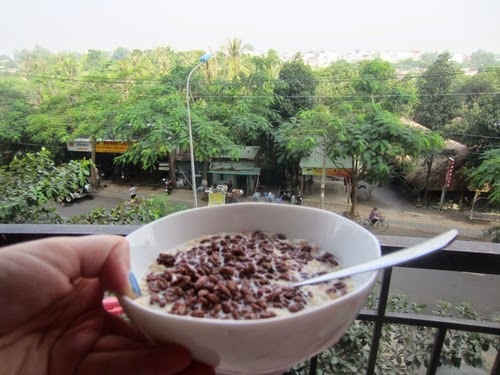 Xa Lo Ha Noi. !&”?%&!”¤ Xa Lo Ha Noi, I was pretty sure the name was familiar because I checked that is the name of the street I do NOT want to be near, ie. very much in the wrong direction. His directions were surprisingly nice. I found myself on a high-way with _ actual _ sign posts _ to _ Bien _ Hoa. I thanked the heavens and enjoyed the nice sunny ride. 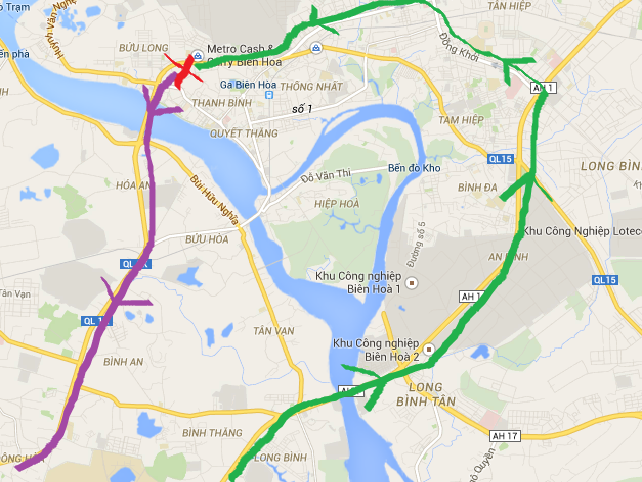 Entering Bien Hoa, hurrah... I was aware I was probably coming in a different route, so I kept my eyes peeled for familiar turnings. We were going through the industrial area I'd never been through before. Finally there was one sign at a crossroads, turn left for “Bien Hoa 1”, turn right for “Bien Hoa 2” or continue going traigh for “Ha Noi 16 869 km” (or something like that). Erm. Had my blink on for Bien Hoa 1 but then the light for Ha Noi 16 869 km changed first and I decided I didn't want to risk being run over my the buses crowding on every side of me, and advanced towards Ha Noi. Realising I had the definite risk of driving past Bien Hoa altogether, I pulled over, for a change, to stare at my map. 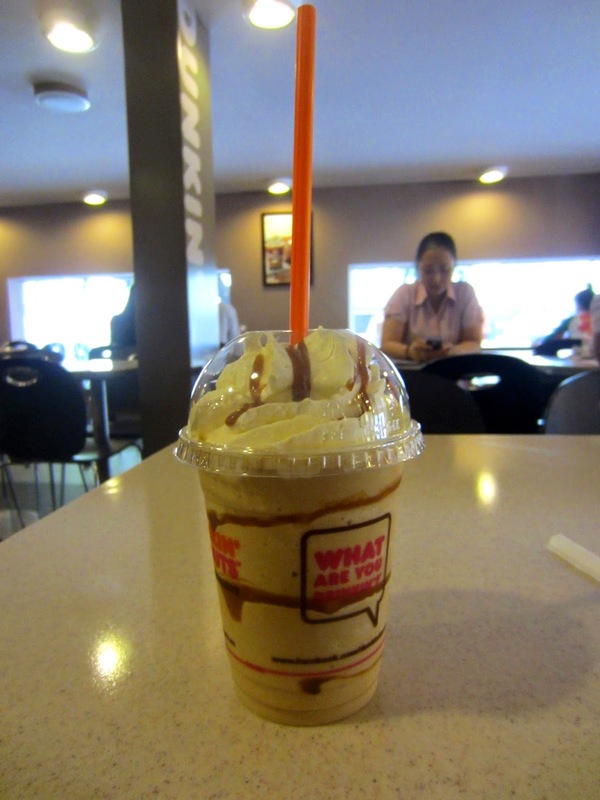 I bought an iced tea off a lady at some official looking thingy which turned out to be a very unofficial bus station. I asked her about Bien Hoa City and Vo Thi Sau (one of the central streets) and she vaguely gestured straight, and then to the right or to the left. I didn't figure out which one she meant, so felt a bit distressed once again. 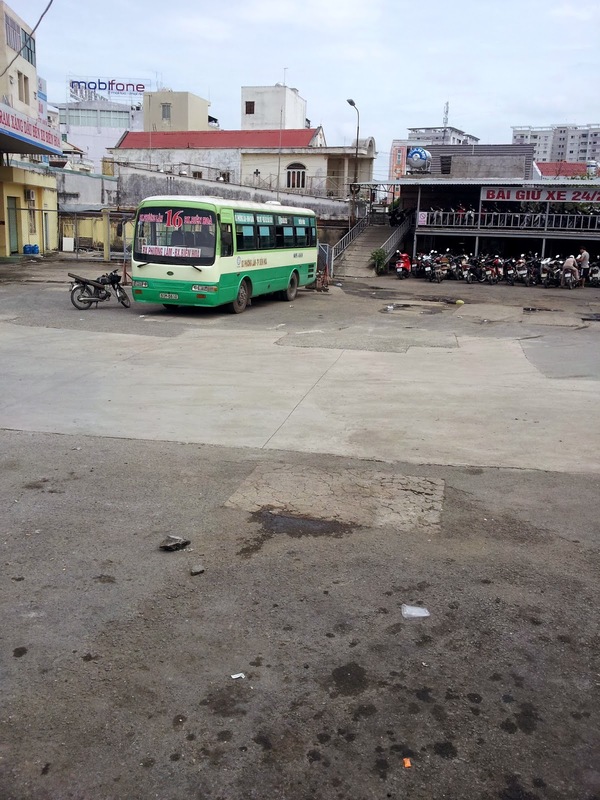 I was just deciding on which friend to call in distress when I realised I found this bus station, Ben Xe Dong Nai, on my map of Bien Hoa. According to the map, I should go straight for a while then turn to the left at the next big street. OK. So, I was wanting to turn left. I was on the outside lane of a road with three lanes to my left. Each lane was jam-packed with lorries. Lorries and lorries and trucks and trucks, all dusty and polluted and smelly and, well, potentially crushing you in an instant. I wasn't going to go try my luck amongst them truckies, looking for a left turn. As we advanced, the motorbikes got basically pushed off the road. Where there was pavement, we drove on pavement. Then it became this bumpy rocky dust road. It was reaching such points of surreal ridiculousness that I had to stop and, krhm, take a picture. Or two. I had my proper disguise of dark sunglasses, helmet and face mask on so no one could pinpoint me as the tourist culprit, so that was slightly reassuring. Then back into the traffic. There were traffic lights ahead. Did this mean the left turn was coming up? I saw working lights pointing right and straight, but not left. But there were still vehicles turning left. One motorbike had stopped on the side of the road to ask something from an official road-working-looking guy at the side of the road, so I followed, and asked “Vo Thi Sau” and pointed to the left. He nodded. Hurray. Navigation through traffic. Realised I was too keen and had gone against a red light as well as being on the complete wrong side of the road, with traffic coming towards me from all sides. Oh well, had it been England or Finland I would've been mortified of embarrassment but, hey, this is Vietnam, where anyone can do anything, so I cheekily made my way against the traffic to get to my own side. And from there on, relatively plain-sailing. I was very close to crying of relief when I finally swerved into my dear old parking area in my apartment block, and flopping onto my lovely pink bed with a lovely chocolate milk for a lovely 15-minute nap before a lovely refreshing shower before five hours of hectic lesson planning and teaching. 5h of driving to and from Saigon plus probably a total of about an hour driving in Saigon = about one tank of petrol. 40,000 dongs. That's 1½ euros, or just over one pound. Even in comparison to my normal way of getting to Saigon: 1 bus (15,000 dongs) and two xeoms (totalling usually at least 60,000 dongs) each way, not even counting all the xeoms/cabs within the city = 150,000 dongs (about five quid). You do the maths. Motorbiking is pretty cheap. 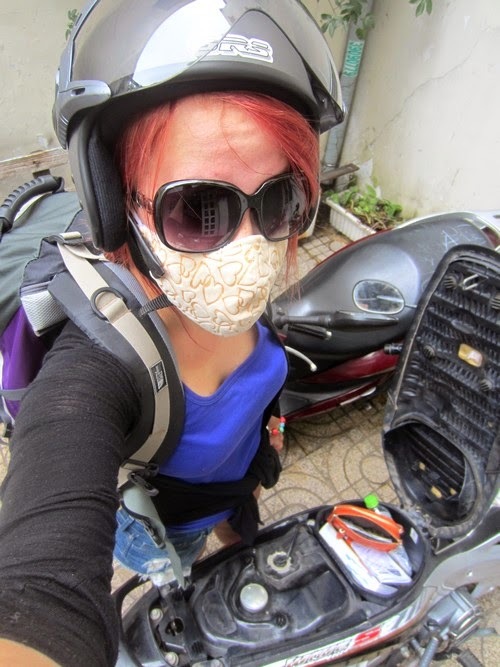 And that was my motorbike trip to Saigon and back. Thank you for reading. Purple: The route I planned to take. Green: The route I took back to BH. I had google maps open as I read your blog. I got as far as Linh Tay – and then, with you, got lost. The trouble of course with maps tattooed onto arms (and other forms of route-specific maps), once you diverge from the route you’re off the map (like Äiti and me in Sheffield just before you flew). 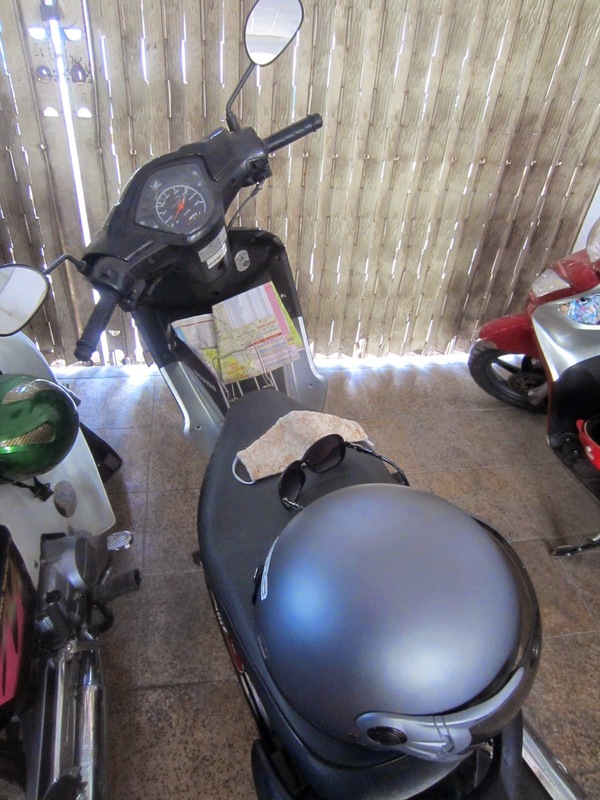 How often do humble motorbikes do the journey from BH to HCMC? Or are the grand intercity highways designed more for lorries and trucks?